Professional boat captain service serving the private and commercial sectors, yacht manufacturers, yacht brokerages, and insurance companies. One-On-One Instruction tailored to your needs in Equipment, Charting, Plotting, Anchoring, Boat Handling and General Seamanship -"Rules of the Road"
Available for Power/Sail Deliveries, Temporary Captain, Owners Representative - during sea trials, yard work, equipment installation and repairs, Boat Consultant in purchase assistance as in locating, previewing boats, advice on equipment and classroom or on-the-water instruction. Our Captains are Transport Canada Certified Master 60 Ton Limited, 150 Ton Domestic (NC2), 3000 Ton Domestic: all inland lakes, both coasts of Canada/USA. 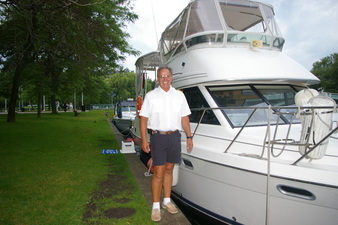 In addition, we can help you with any boating information you may want for all aspects of recreational and commercial boating and would be happy to help you with any questions you might have regarding the Great Lakes, America's Great Loop (circumnavigation of Eastern North America) the Bahama's, ports, weather, etc. FREE! Add an additional $150.00 per day for each crew member required. Insurance Requirements: Captain and crew (if necessary) must be added to owners' policy for duration of charter. Delivery costs will be estimated prior to departure. Full estimate due upon departure. Additional costs also include all delivery expenses (such as: fuel, docking fees, food and transportation costs to original point of departure, and any repair or additional costs necessary to fulfill delivery contract. A full accounting of all expenses will be itemized and submitted upon completion of the delivery. Any and all prepaid expenses not used will be returned in full. Any expenses incurred greater than the prepaid amount will be billed. Prices may change without notice due to raising fuel costs. $275.00 for complete 4 hour individually tailored training package. $50 an hour for each additional hour and traveling time. One on One Instruction: Docking and Handling Your Boat - Your Equipment - General Seamanship -"Rules of the Road". Insurance Requirements: Captain and crew (if necessary) must be added to owners' policy for duration of training. Add an additional $100.00 per day for each crew member required.